Toby and Kelly are fervent lovers by day – well, not in the most literal sense of the word, but they follow each other around all day. Toby grooms Kelly, Kelly regurgitates to Toby and except for a couple of spats it’s generally a pretty gross parakeet lovefest. During the day they even nap side by side very comfortably, it’s really cute, especially since during nap time they both “talk” in their sleep. Night sleeping is a different matter entirely, there are three perches that one would think would be acceptable for a comfortable evening’s rest, two are at the same height, and one of them can certainly fit two sleepers, but no, there must be one parakeet to rule them all by sleeping higher than the other! 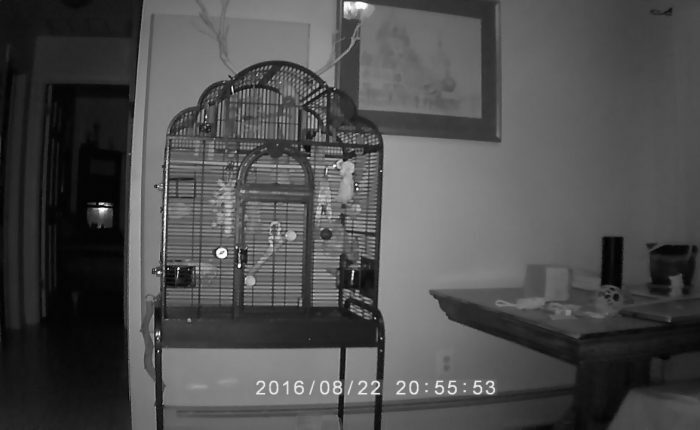 So although by day our budgies are besties, all bets are off as soon as the lights start to dim, and the cage becomes the venue for a battle royale of perch dominance. They start yelling at each other furiously and engage in some very serious beak warfare. Usually someone ends up falling to the bottom of the cage with a heavy thud at least once before the battle has ended. I should note that “yelling” in this context means a steady stream of terribly cute angry peeping noises. For months the only way it ever ended is with Kelly on the top perch and Toby on one that’s slightly lower, and even after they were in position Kelly would angrily vocalize at Toby to keep her in place. Recently though we’ve had nights where Kelly ends up lower or where they both end up on the same perch. We always leave one dim light burning so that if they decide to reopen perch negotiation in the middle of the night they can see to do it. I’ve thought about splitting them up for bed time, especially since it feels wrong to watch them engaged in what frequently appears to be a death match, but apparently this is very common behavior – if you’ve got 2 or more parakeets you’re going to have night time battles for dominance, and much like many other issues, the only one with a problem is me! 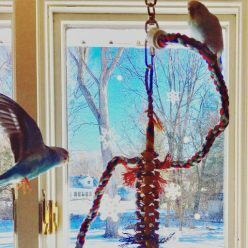 The parakeets are fine and the results of the fights may even help solidify the terms of their relationship. Also, Toby hasn’t had a single night terror since they started sleeping in the same cage, and that’s totally worth the 15 minutes of squabbling every night. We had similar issues with Tuck and Robin and eventually decided to give them each their own cages and let them out together during the day. They still had their squabbles, but we were much more comfortable knowing that when we were gone one wasn’t going to shove the other off a perch haha. I like that idea! I’m torn between whether the fights or Toby’s night terrors are more dangerous. We’ve definitely heard the thud of a deposed percher more than once lol!